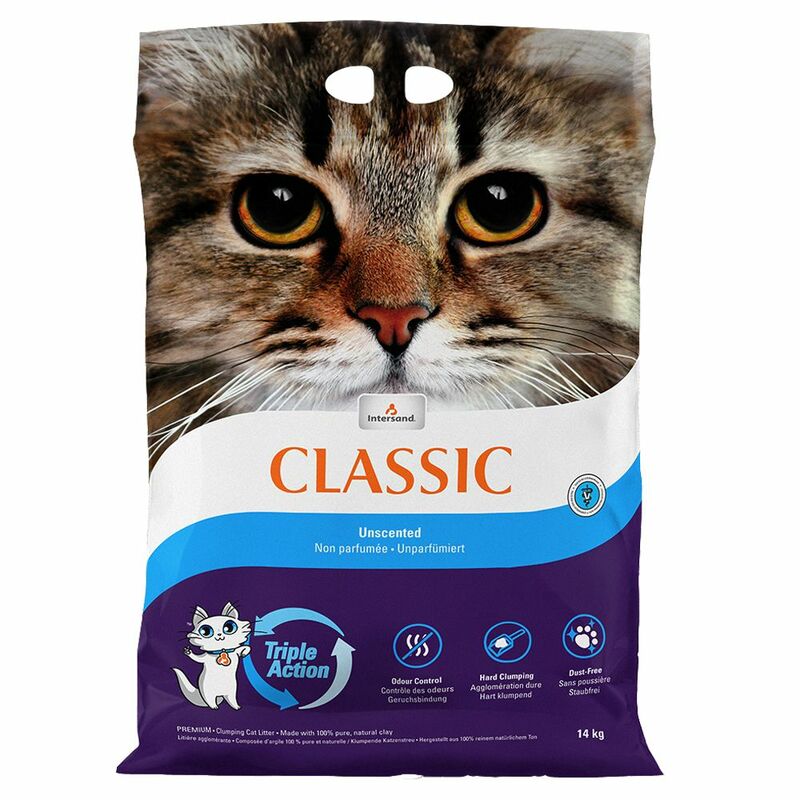 New design, same great quality - this ClaΒic Unscented Cat Litter, formerly Extreme ClaΒic, uses exclusive patented TRIPLE ACTION™ to effectively get rid of unpleasant odours. Thanks to this extra-strong quick-clumping litter from Intersand ClaΒic, clumps of litter will not get stuck on your cat's paws or the base of the litter tray. This helps ensure your cat's litter tray is quick and easy to clean, and prevents soiled litter falling out of the tray. The high absorbency of around 350% its own weight makes ClaΒic Unscented Cat Litter even more economical to use, as only the clumps need to be regularly removed. The entire tray does not need to be changed with every clump - simply top it up at regular intervals! ClaΒic Unscented Cat Litter is also 99. 9% dust-free, which helps minimise the dirt brought into your home, protecting both your help and that of your cat. This premium cat litter is a natural product from Canada and entirely non-toxic. ClaΒic Unscented Cat Litter at a glance: Premium clumping litter with extra-strong clump formation With TRIPLE ACTION™: patented technology to neutralise odours Unscented 350% absorbency rate Up to 99. 9% dust-free Doesn't stick to paws Economical thanks to the clumping.